Brockville General Hospital (BGH) and Kemptville District Hospital (KDH) are asking for the community’s help. Together, the hospitals are working closely with the Trillium Gift of Life Network (TGLN) to raise awareness about the value of donor registration. According to the TGLN website, every three days someone dies in Ontario because the life-saving organ transplant they need is not available, yet less than 30% of Ontarians have registered their consent to be a donor. And there are more than 1,500 people in our province waiting for organ transplants and thousands more waiting for tissue transplants. To encourage donor registration, the two hospitals have agreed to a friendly challenge: inspire the most people to register their consent to organ and tissue donation during the month of April, which is “Be A Donor Month” across Ontario. 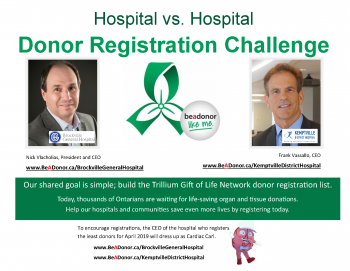 Both hospitals have set up campaign pages on TGLN’s website, BeADonor.ca, to track the number of registrations received in April, and are encouraging their staff, volunteers and members of their local communities to register before the month is out. “As a hospital, we need to do our part,” shared Nick Vlacholias, President and CEO at BGH. “Organ and tissue donation has the power to save lives and keep families together. It is our responsibility to help bring this awareness to the community.” To support BGH in this challenge, please register at www.BeADonor.ca/BrockvilleGeneralHospital. “We believe that if more people were aware of the full impact of organ and tissue donation, they would register,” added Frank Vassallo, KDH’s CEO. “One donor can save up to eight lives through the gift of organs, and another 75 lives can be enhanced through the gift of tissue, which includes eyes, skin, heart valves, and more.” To support KDH in this challenge, please register at www.BeADonor.ca/KemptvilleDistrictHospital. As part of the challenge, the hospital that records the lesser number of new donor registrations in April will see its CEO spend the day as “Cardiac Carl,” the TGLN mascot. Both CEOs were quick to agree to the contest and shared that the true winners are the thousands of patients waiting for organ and tissue donation. Registering online to be a donor takes only two minutes. Potential donors just need to provide their Ontario health card number and some basic information including their date of birth. Donors must be at least 16 years of age.